Fast Food Workers strike | Demand higher salary in U.S.
Home » fast food » higher salary increase » strike » United States » World » Fast Food Workers strike | Demand higher salary in U.S. Many of fast food workers in McDonald's, KFC, Burger King, Wendy's, and other chains walked out and demand for higher salary increase in United States. The Ffast food workers strike started on Monday, July 29. 2013. The fast food workers are carrying signs with a slogans saying, "Super size my pay!," they demand a raise wages up to 15 dollars per hour. 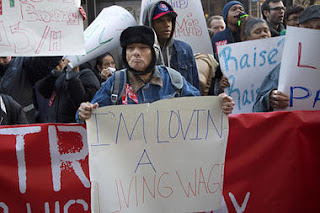 The National Employment Law Project (NELP) said that the average fast food worker makes only $8.94 per hour — scarcely more than half of what strikers say is a 'living wage.'" I think and hoping this strike will make those fast food company to think more about the demand of their employees. However, none of the fast food company had commented on the strikes. Comments or suggestions about "Fast Food Workers strike | Demand higher salary in U.S. " is important to us, you may share it by using the comment box below.